Both MNCs and Indian companies have started investing in 'smart' factories that combine automation, new processes, industrial Internet and Big Data. At a factory in Chakan, an hour's drive from Pune in Maharashtra, General Electric (GE) is making a $200 million gambit of bringing the latest in manufacturing to India. The 67-acre campus houses brick-red and white administrative blocks, a creche for children of staff members, and even a helipad. But the real action is taking place inside the 250,000-square-feet shop floor where a handful of workers are conducting trial runs on seven 'multipurpose machining centres' lined one after another, resembling a coach. The computer-controlled machines, imported from Germany and Japan, make metallic parts. Steel, alloys and titanium are fed into the machines that churn out components with an accuracy of 0.005 millimetres for use in power equipment, oil and gas drilling, and the aviation industry. Behind these machines, a few workers are busy trying out assembling wind turbines. Right in the middle of the shop floor sits a three-dimensional (3D) printer, which is producing scaled down versions of actual parts. Eventually, it would print out components that go into jets, engines, and turbines. The factory will begin production later this year. When it does, it will be one of India's smartest factories that bring together automation, the Industrial Internet where machines communicate with each other, and Big Data - large data sets derived from sensors installed in machines. Manufacturing is no longer just about hardware. "Smart factories are at the intersection of hardware and software," says Jeffrey W. Connelly, Vice President of GE's Global Supply Chain, when Business Today meets him in Pune where he had come to attend a meeting with suppliers. "It is exactly what 3D printing is, monitoring and diagnostics is, sensing technology is. We call it 'predictivity'. In the world of manufacturing, it is having the ability through data to know things before they happen," he says. So, all the machines at the Chakan plant are connected to a central server. Data from the trials are being used to analyse cycle times. The data will also be used to improve the performance of machine tools and cut down process time as well as defects. Like GE, many other multinational companies in India are investing in advanced manufacturing . German auto giant Volkswagen's India plant, also in Pune, has 114 robots and many machines there are interconnected. "Our framer or laser welding robots are connected with their manufacturers back in Europe. Whenever there is any issue with the robots, the engineers back in the parent company can trace the defects faced, find the cause and resolve it remotely," says Andreas Lauenroth, Executive Director (Technical) at Volkswagen India, via email. The carmaker is procuring more robots, increasing automation of other processes and exploring the possibilities of using 3D printing in India. About an hour's drive from New Delhi is the town of Jhajjar in Haryana where Japanese consumer durables maker Panasonic is investing $200 million in a 307,000-square-metre manufacturing facility it calls 'Technopark'. The factory started production last year and has a capacity to make one million air conditioners and 500,000 washing machines. The production as well as the testing process at the plant is mostly automated. Take washing machines, for instance. The washing machines are not tested with water to check leakage. Instead, a machine creates air pressure inside the washing machine tub. The air pressure equipment and the conveyor belt carrying the tubs both have sensors and "talk to each other". If the pressure drops after a few seconds, it indicates a leakage and the conveyor belt stops automatically. Why are multinational companies investing in advanced manufacturing in India? For GE, investment in automation is mostly aimed at making its new plant "multi-modal". There are very few multi-modal factories in the world, and this is GE's big experiment to make products for different industries on the same shop floor using common machines such as the multipurpose machining centre. The Chakan factory has centres of excellence like fabrication and high-end welding as opposed to product lines. Different products pass through these centres, whereas earlier separate factories would have been required to make such products. 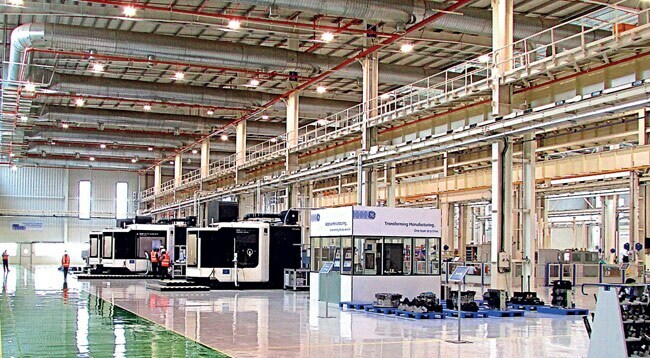 This is GE's only multi-modal factory in India, though it has similar - but smaller - facilities in some other countries including Vietnam, China and Hungary. A multi-modal factory may appear similar to 'flexible manufacturing' practiced by some automobile companies which can switch between diesel and petrol car variants, but the work GE is doing is much more complex. "We are talking of multiple products under the same roof, which is different from the ability to scale up or scale down. If you are passing aviation, wind turbine, and power components under the same centre of excellence, that is a lot more radically different than switching from diesel to petrol engine in car making," says Banmali Agrawala, President and CEO for South Asia at GE. GE's investment in Indian manufacturing has to be understood from a broader perspective. Governments across the world want to create more jobs and the manufacturing sector is a powerful platform. They are forcing companies to manufacture locally. This implies that, in the future, manufacturing will no longer be restricted to certain countries like China. "It is a far more decentralised, distributed effort. That is a new phenomenon. As a consequence of this shift in the global economy, companies such as GE have to adopt a different approach," says Agrawala. But decentralisation of manufacturing has one problem - it poses a challenge to the concept of economies of scale. Investment in multi-modal manufacturing comes in handy here. "The objective in the Chakan plant is to get scale in a facility through volumes which are not necessarily large from one product," says Agrawala. "We, at GE, have an advantage. We are not a one-product company." 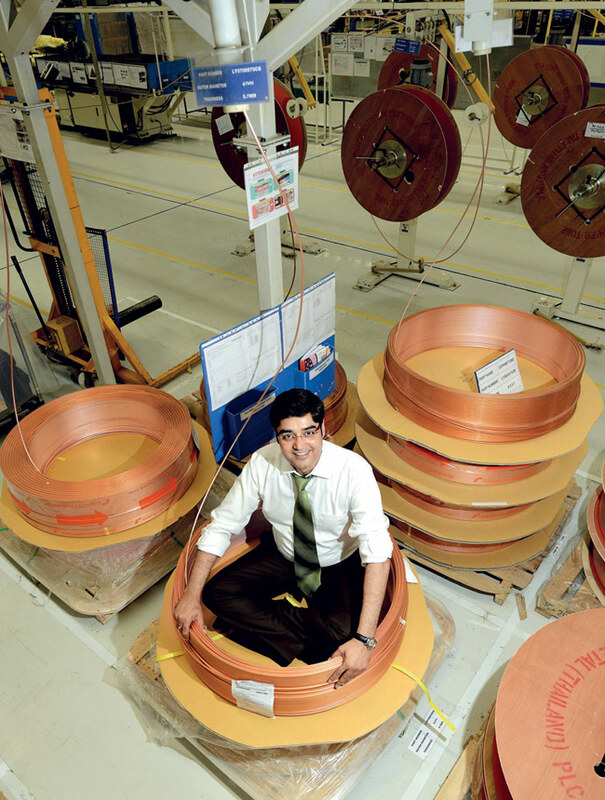 In the pic: Manish Sharma, MD, Panasonic India at company's Jhajjar plant, where it makes ACs and washing machines. The production and testing process is mostly automated. The factory is highly automated for three reasons. One is ease of workers. Second is quality of products. And third is scalability in the future"
Dutch consumer electronics giant Philips has a similar problem when it comes to the manufacturing of medical equipment. Its plant in Chakan, near GE's plant, has a capacity of 1,500 imaging systems a year. It makes equipment for cath labs and non-invasive surgery as well as diagnostic X-ray machines but they are all low-volume, high-value equipment. To keep its factory humming to capacity, the company kept the design flexible. So, the plant doesn't have a dedicated production line for one type of equipment and can adapt to the configuration requirements of different clients. It exports to China, Columbia, Peru, Chile, Argentina, France, Austria, Italy, and Poland. "When you are looking at a low-volume business like this, it has to be multi-modality," says Subhash Vashisht, Director of Imaging Systems Operations at Philips Healthcare. "If you have just one [production] line and it is not churning out business, your factory will not be viable." Multi-modal and flexible manufacturing have huge implications on employee costs as well. One can use a common set of employees for different product lines, resulting in better utilisation of human resources. "In surgical equipment and diagnostics, we train people both ways," says Vashisht. Modern processes such as multi-modal can, therefore, impact direct jobs. Smart factories employ very few people, and many wonder if manufacturing can indeed create the massive number of jobs required to absorb the growing workforce in developing economies such as India. Rajan Anandan, Managing Director at Google India, is one sceptic. 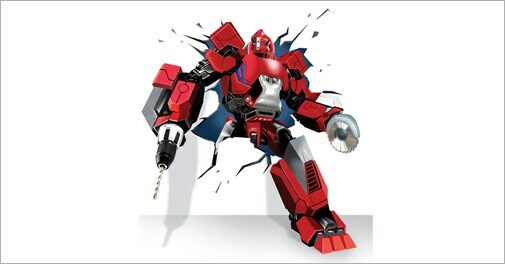 At a recent BT event, he said that in two decades, robots would do all work that industrial workers do today. "Most manufacturing will not require people in the next 25 years. We should be thoughtful about where we are headed. We have to be careful because manufacturing will employ robots and 3D printing," he said. Already, manufacturers are either employing less people than before or are producing more with the same number of people. Five years ago, a factory the size of Panasonic's at Jhajjar would have required 1,500 to 2,000 people. "But now during the peak season, we are running it with 700 people," says a factory manager at Panasonic. Bajaj Auto's output per employee has nearly doubled since 2008. Mahindra & Mahindra's vehicle and tractor output per permanent employee has also doubled since 2008. While multinational companies are at the forefront of this technological shift on the shop floor, Indian companies are slowly catching up. Although local companies are not tinkering with their old plants, their new factories are increasingly automated. JK Paper is one such company. It commissioned its second plant in Odisha's Rayagada in 2013 with an investment of Rs 1,775 crore. The company installed modern digesters - used to turn wood chips into pulp - as well as paper machines. A.S. Mehta, President of JK Paper, says the company earlier had four digesters with a capacity of 300 tonnes of pulp a day, but now only one new digester can crank out 630 tonnes daily. The new paper machine can make 165,000 tonnes a year while four older machines at the same plant have a combined capacity of 125,000 tonnes. JK Paper has also automated its warehousing system using robots. All this automation means that the new factory employs just 400 people compared with 1,400 people at the older plant in Rayagada. Besides the improvement in productivity, another reason that is prompting Indian companies - especially exporters - to opt for automation is the high quality and precision that modern machines offer. 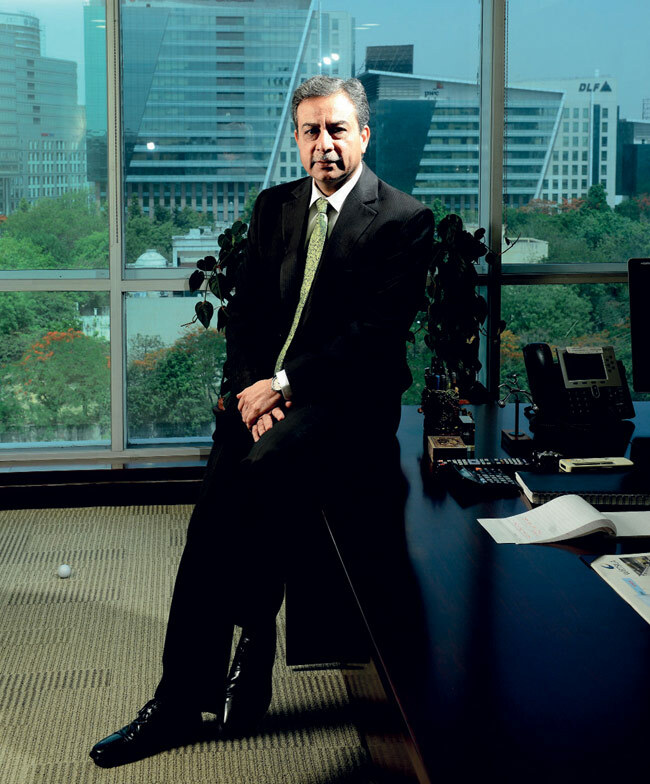 Satish Sharma, President of Asia Pacific, Middle East and North America at Apollo Tyres, says productivity at its plant near Chennai is three times higher compared with the company's Vadodara factory thanks to large-scale automation. The Chennai factory, which exports to the European market, has been "aligned to the world's best", he says. Trade unionism and labour strife are other important reasons pushing manufacturers towards automation. While labour in India will be cheaper compared to the capital investment required for automation in a paper or tyre factory, companies may not want to deal with the stress that comes along with endless wage negotiations. "Sometimes, we don't calculate the ancillary cost of people. You also forget to calculate the future incidents of labour liability," says JK Paper's Mehta. "While today you may pay Rs 7,000 a month to a worker, there will be wage revisions in a few years' time. Then there are union issues and absenteeism. The stress cost of management is much more than what you invest." Smart factories are here to stay, and grow. 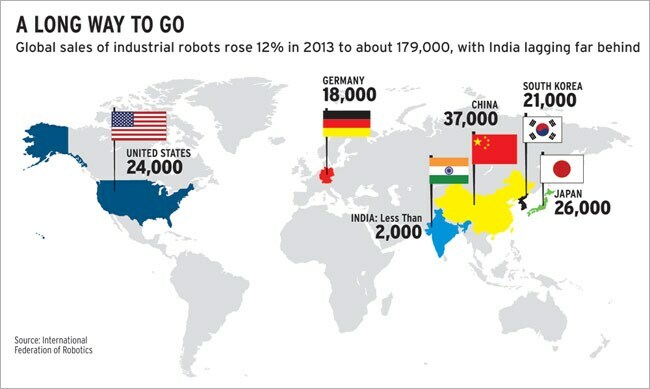 Whether robots will eat up jobs that India desperately needs is an inconclusive debate. But the rise of the machines need not be scary. If automation makes products like air conditioners cheaper, it would mean an increase in demand and sales. That could potentially add more retail jobs. Some believe smart factories will create many more jobs in the logistics chain, if not within the factory. "If we can enhance productivity through new technology, that means we can do five [products] instead of three," says GE's Connelly. "That means we need more designers, and more sales, finance, packaging and transportation people. The more productive we can be, the better it will be for everyone."